Experience local chefs & share homemade meals without the hassle. Save time and $$$ by sharing the burden of cooking daily meals with family, friends, and neighbors. Share for free and eliminate waste at the same time. Earn $$$ and sell directly to consumers on UGE Marketplace. Cook when you want without being tied to brick and mortar. Experience the luxury of eating fresh made meals daily. Share socially or buy from certified chefs. It's like having a personal chef in your pocket. 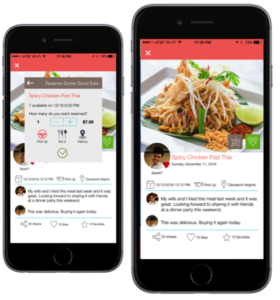 UGottaEat is a social network for sharing, selling and requesting homemade meals on demand. UGE is a Health and Wellness App platform that gives everyone unbounded access to food through a network of local cooks, chefs and food suppliers. Sign in and invite friends to start sharing. Set your profile so we know where you are and chefs know what you like. Share delicious homemade food with friends (free) or Search for UGE Chefs (paid). You can even request a specific Homemade meal…On-Demand. Select meals, message the Chef and dine-in or pick up. Leave Reviews, Likes and Share! Mindfulness Matters is a lifestyle blog that highlights healthy living and being mindful. By promoting holistic practices, UGottaEat’s Mindfulness Matters blog hopes to make a positive impact in people’s lives.